The Scottish Chamber Orchestra is currently offering a two part programme celebrating Mendelssohn and music in a similar vein. On Thursday we got two pieces by the main man, along with a Rossini overture and a charming suite of Respighi bonbons, published almost a century later. Whilst the Queens Hall is a welcoming venue with a genial atmosphere of really committed Musica Affecianadi Geriatrica the venue, as an old church, is pretty basic with stackable chairs forming the main stalls whose lack of racking means sightlines are poor, particularly as in this evening’s case where the size of the orchestra meant dispensing with the stage. We saw the top half of the conductor, the heads of the soloists, and the wind and brass, the strings and woodwind, in glorious invisibility. This made it frustrating and difficult to engage. One wonders if the excellent young conductor, Daniele Rustioni, knew this, for his style of conducting was endearingly inclusive in terms of rapport with the players and at times almost swaying to the music with frequent flicks of his fine head of hair to engage with the audience. But notwithstanding these built-in disadvantages and compensating factors, the music, and the playing, spoke for themselves in a delightful cornucopia of early romantic music. It was a joy from start to finish. Mendelssohn was the main event and is what I shall concentrate on but let me say first that Rossini’s Overture L’Italiana in Algeri (The Italian Girl in Algiers) delighted us with a ridiculous contrasting opening of pizzicato followed by orchestral chords in a positively Mozartian romp, with special mentions to the oboe of Robin Williams and piccolo of Alison Mitchell. Our lively conductor almost ran back to the podium after minor re-seating between works and got straight into Respighi’s Ancient Airs and Dances: Suite 1, which did exactly what it said on the tin, a pleasant collection of instrumental ditties with oboe again to the fore and some strong cello playing from Principal Philip Higham. And now the main attraction, Felix Mendesssohn-Bartholdy (1809-1847), in the view of many the most precocious musical talent of all time, including Mozart and Schubert; the critical difference between him and Mozart was that his father did not exploit his youthful talents and instead let him grow. Nonetheless he died aged 38 only a few years longer than Mozart’s 35 and Schubert’s 31, but the latter was disease driven (typhoid or syphilis, depending whom you believe), whilst the former two was almost certainly overwork. His catalogue is enormously popular, and this evening we got to hear two lesser known works. 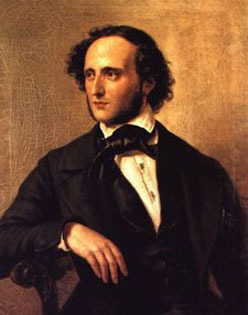 Mendelssohn’s Two Concert Pieces were in effect small scale concertos for two clarinets, in this case regular B-flat and bass. The bass clarinet made a pleasant change to hear in these two light, entertaining pieces which while hard to take seriously were none the less enjoyable for that. SCO Principal Maximiliano Martin and sub Principal William Stafford disported themselves with aplomb and the whole band, and audience, had a great time. I did not know Mendelssohn’s 1st Symphony in C minor at all and was impressed by its structure and depth, late Mozartian in style, and astonishingly, composed when he was 15. There was no hint of immaturity in this work whatsoever, which the orchestra played with verve and enthusiasm throughout. So, all in all, this was a thoroughly enjoyable evening of accessible, tuneful music, very well played throughout with everyone, conductor, soloists, band and audience, having a great evening’s entertainment. 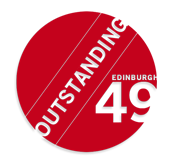 Visit Edinburgh49 at the Queen’s Hall archive.